There’s a new pet deal for dog lovers from our pals over at BarkBox! 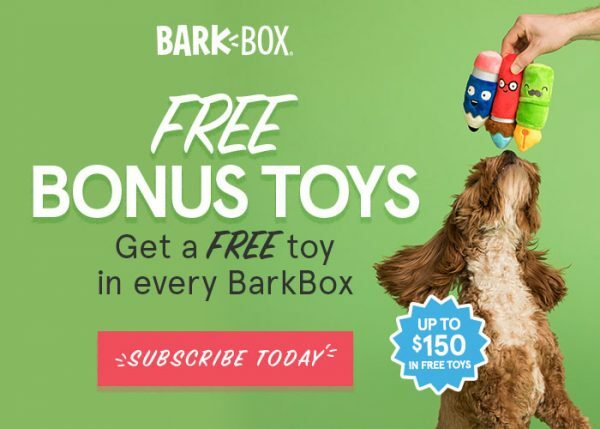 Now thru 4/20 get a FREE extra toy every month (up to $150 value) when you use this link and order a 6-month or 12-month BarkBox subscription customized for your dog’s size and allergies. No promo code is needed, but be sure to select “Yes, Please” when you get to the Pupgrade section of your order. Free shipping is included for US and Canada. Treats are made in North America, and everything comes with a satisfaction guarantee. If your dog ever receives an item they don’t like, BarkBox will send you a replacement at no charge. Visit BarkBox.com to get started. If you aren’t quite ready for a 6 or 12 month commitment, you can use this link and BarkBox coupon code WOOFWOOFMAMA to get a FREE extra month added to the commitment-free monthly BarkBox subscription plan. Offers are not combinable, so choose the one that works for you. To learn more about BarkBox and see what’s inside some recent boxes, visit our BarkBox Review and Coupons Page.